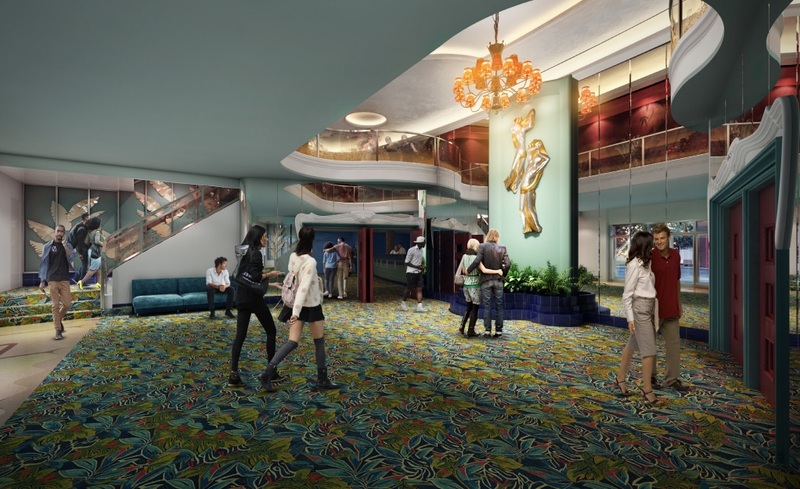 The multimillion dollar renovation of the Alameda Theater will include a more than 50 percent reduction in seating capacity, the addition of bars and lounges, a stage that protrudes 13 feet into the orchestra level seating, and an ADA accessible elevator. San Antonio residents can hear more of the plans from the Washington, D.C.-based architecture team renovating the circa-1949 theater during an open house—6-8 p.m. Monday at Guadalupe Theater, 1301 Guadalupe St. The open house will be hosted by the Alameda Theater Conservancy (ATC), a nonprofit organization that manages Alameda complex, which consists of the theater, Texas Public Radio’s (TPR) future headquarters in the theater’s annex section, and the future amphitheater, part of the San Pedro Creek Culture Park currently under construction. Construction on the Alameda Theater, 318 W. Houston St., is scheduled to begin this fall, and is projected to open early 2021. Originally, the theater had around 2,500 seats. 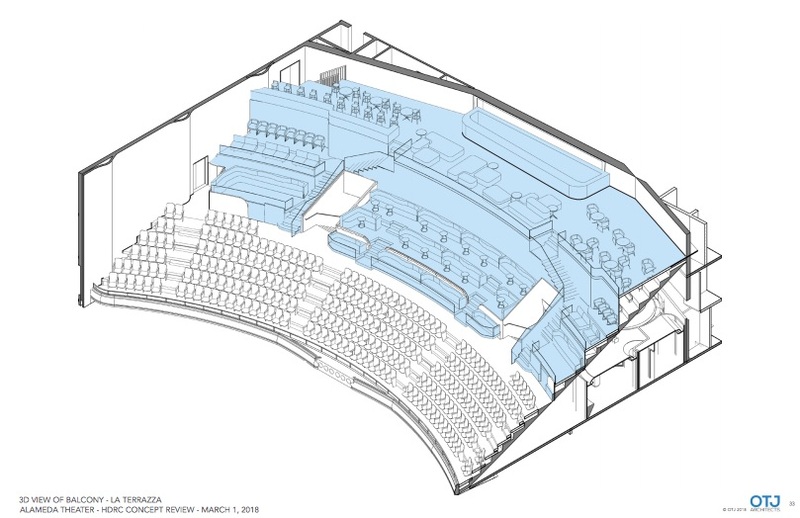 This will decrease significantly with seating ranging from 1,050 to 1,300 seats, which can take the form of theater rows or table/chair arrangements at the orchestra level, according to Gary Martinez, a partner at OTJ Architects, the D.C.-based architecture firm leading the renovations. Martinez said the reduction in seating capacity is because of seat-width regulations that say seats must be 20 to 22 inches wide, rather than the original 17 inch seats. 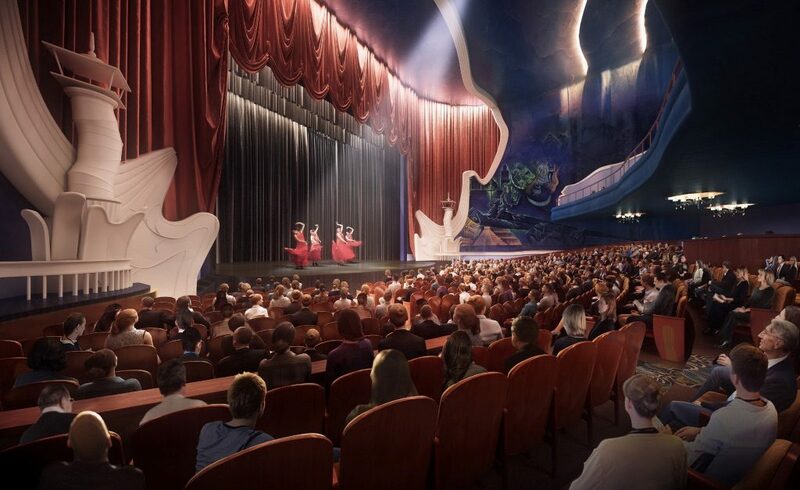 The designers, which includes San Antonio firm Seventh Generation Design, are going for a “more intimate space.” A lounge and bar area will be added to the back of the orchestra level—between the main seating space and the lobby. 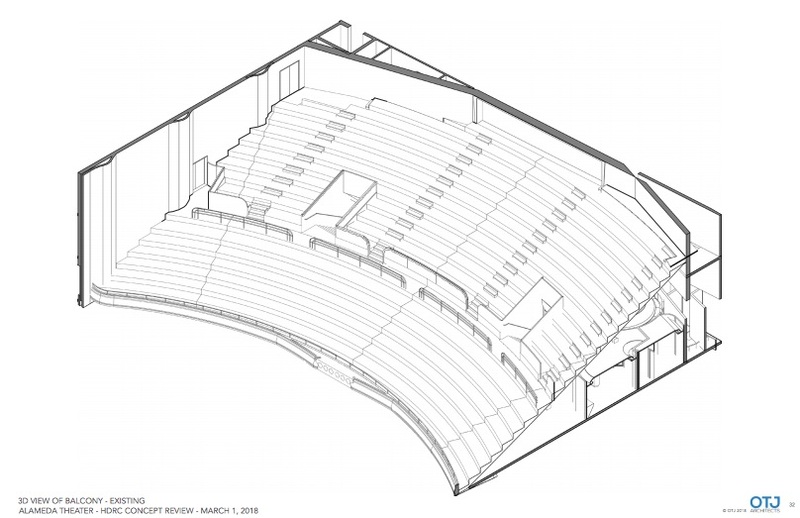 In the upper balcony, the designers propose the creation of “three large standing room or lounge tiers,” or “La Terraza,” which will include its own bar and drink rails. The Historic Design and Review Commission gave conceptual approval to the renovations on March 20. Kaiser served as interim director of the San Antonio Symphony until January. So far, Bexar County and the city have contributed $9 million each. 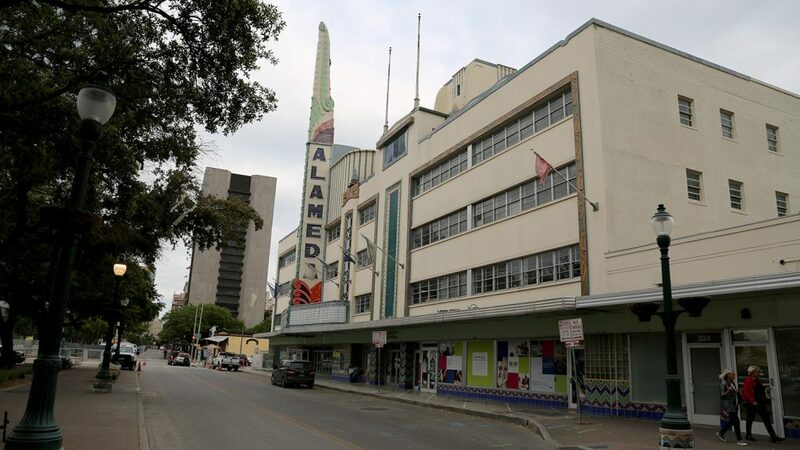 The City of San Antonio purchased the Alameda Theater in 1994 and in 2017, the city leased the theater to the conservancy in an agreement that lasts until 2036. The stage’s depth—the distance between the back and front of the stage—will increase from 15 to 30 feet. The original restrooms of the theater will be kept and rehabilitated. 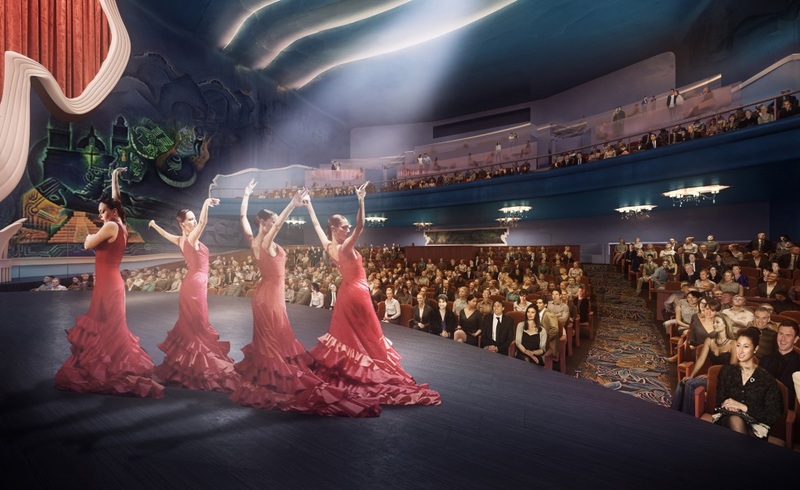 Martinez said he would retain as much of the original materials as possible, such as existing murals in the theater, draperies and lighting. Martinez suggested during the HDRC hearing these interior materials may require “alternate treatments” to preserve them. The San Pedro Creek Culture Park, TPR’s headquarters and the Alameda Theater renovation will all be under construction simultaneously. Kaiser said the project team isn’t expecting any delays to the Alameda’s renovation, and that they’ll coordinate construction with each project team. TPR’s new headquarters is being designed by Overland Partners, a local architecture firm. TPR expects to move into its new headquarters next January. Looks good. Lounge are is a great idea.